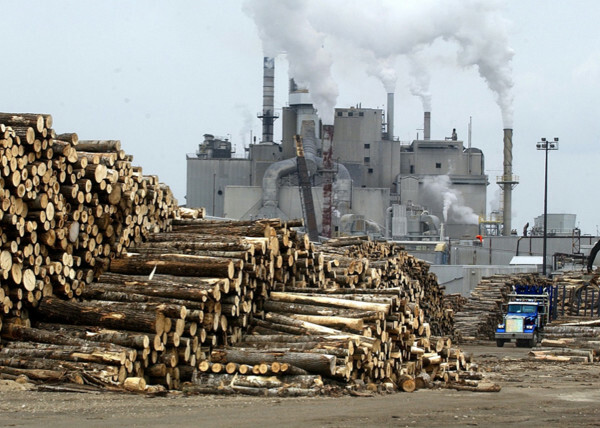 Piles of logs await the chipper in the wood yard of the former International Paper mill in Jay, Maine, in this 2006 photo. Now owned by Verso, the mill uses a mix of spruce, fir, poplar and pine to make its specialty grades of coated paper. PORTLAND, Maine — Verso Paper Corp. announced the completion of its $1.4 billion purchase of NewPage Wednesday in compliance with an antitrust settlement with the U.S. Department of Justice. The settlement allowing the deal is still subject to final approval by a U.S. District Court judge in Washington, D.C. The joined company operates a paper mill in Jay, which employs about 860 people. As a condition of the settlement, NewPage sold its Rumford mill to the Canadian papermaker Catalyst — along with another mill in Biron, Wisconsin — for $62.4 million to reduce its share of the coated paper market. Joe Nemeth, Catalyst’s CEO, said in a prepared statement that the acquisition represents “a new chapter” in the company’s history and makes it the only papermaker in North America with production in the West, Midwest and East. The company has mills in British Columbia, Canada, and now the mills in Wisconsin and Maine. Robert Mundy, Verso’s chief financial officer, told the Bangor Daily News on Wednesday that Catalyst took over ownership and operations at those mills effective Wednesday. The Rumford mill employs about 800 people and produces coated paper often used in food and beverage packaging. Tony Lyons, a spokesman for Catalyst at the Rumford mill, said that Catalyst plans to maintain employment levels and production there. “They are a paper company and that is a bit of a change for us,” Lyons said, referring to NewPage, which was backed by private equity investors. Without selling those mills, federal Department of Justice officials found the merged company would have controlled more than 50 percent of the North American market for paper used primarily in magazines and catalogs and more than 70 percent of the market for paper used for adhesive labels. The company projected that the merger would result in about $175 million in savings within the first 18 months. The combined company has about $3.5 billion in sales and about 5,800 employees at eight mills in six states, and will operate under the new name Verso Corporation. Verso pursued the deal as a plan to save it from bankruptcy, taking on the assets of its larger competitor, NewPage. Before the antitrust settlement allowing the deal to move ahead is complete, the Department of Justice is required to publish the settlement terms, a report on the deal’s impact on industry competition and the antitrust claim the settlement resolves in the federal register and in certain newspapers 60 days before approving the settlement. After accepting comments about the proposed settlement and the company’s competitive impact statement, the Department of Justice will submit comments to the court along with a response and either ask for approval or withdrawal of the final order. Mundy said he doesn’t see that comment period posing a major hurdle to Verso’s purchase of NewPage sticking. Shares of the company were trading up 4.7 percent, at $3.37 per share, when the New York Stock Exchange closed at 4 p.m. Wednesday. When the deal was announced in January 2014, it raised concern in the industry about whether it would result in mill closures. Since that time, Verso announced the closure of its Bucksport mill and sale to a scrap metal dealer, which will need to clear a legal challenge from the Bucksport mill’s machinists union before moving ahead. In court filings, Verso’s Paterson testified in sworn statements that the Bucksport sale was not part of the merger deal with NewPage. Jeff McGlin, a spokesman for the Canadian scrap dealer American Iron & Metal, which plans to buy the mill for $60 million, testified that its agreement with Verso did not require that it demolish the mill. Since the sale closed, rumors have swirled about whether the scrap dealer was the only company bidding on the mill. Paterson testified that he is “not aware of any manufacturer of coated groundwood paper that has expressed an interest in buying the Bucksport mill,” adding his opinion that a buyer interested in papermaking would not be interested in the mill and its power generation assets at a price higher than $60 million. Kimberly Tucker, an attorney for the machinists union, plans to argue before the court that Verso and NewPage participated in a conspiracy to secure more control over the coated paper market in North America, in violation of federal antitrust laws. The union’s antitrust suit aims to preserve the mill as a going concern. A hearing on the antitrust claims is scheduled for 1 p.m. Tuesday Jan. 13, in U.S. District Court in Bangor.